Now that peach season is finally here, I can resoundingly proclaim that summer's officially here as well. It's definitely not summer in the south until you bite into your first ripe, juicy peach. My kids love them, I'm obsessed with them... I am a born-and-raised Georgia girl, after all. I love using them in both sweet and savory applications - anything from an appetizer, to a main dish, to a dessert, to a cocktail - anything is fair game. Pssst, if you're as obsessed as I am with peaches, check out the Pinterest board I've created. You will feel like you've died and gone to peach heaven. So on to this fantastic use for peaches. This dinner is pretty much my favorite way to eat. It's light and healthy, uses lots of fresh and seasonal produce, and it's full of flavor and quite filling. I started with a bowl of fluffy quinoa, then layered on a mixture of spiced and seasoned black beans and corn. 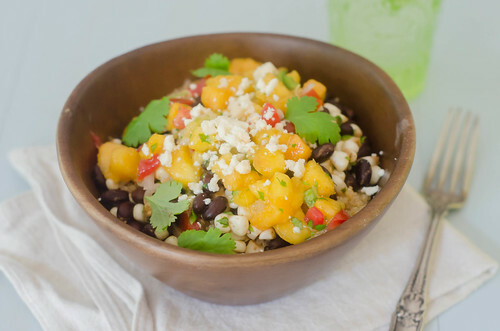 Finally, I topped the bowls with plenty of fresh peach salsa and a small sprinkle of queso fresco cheese. You have plenty of varying textures, flavors, you have sweet, salty, spicy... it's good stuff here. This is super fast and easy, which is definitely a must for me these days. As the quinoa cooks, prepare the peach salsa and mix up the black bean mixture. You can even prep all the components ahead of time, and just store it all separately. Assemble when you're ready to serve. Or if you're making this for a group, let everyone make their own bowls - I went easy on the spice, but I think some pickled or fresh jalapeños would be really great sprinkled on top as well. We all really loved this dinner, and the leftovers were great for lunch the following day. I love peaches so much that I can't pick a favorite recipe or way to eat them, but what's yours? Combine all the ingredients in a medium bowl and gently stir. Allow to sit 10-15 minutes before serving, to let the flavors meld. To cook the quinoa, add it to a medium saucepan with the water or broth. Bring to a simmer and cook, covered, about 15 minutes. Remove from heat and allow to sit for 5 minutes, then fluff it with a fork before serving. Meanwhile, combine the beans, corn, onions, cumin, chili powder, cilantro, and lime juice in a medium bowl. Stir to combine, then season with salt and pepper as needed. To serve, layer the quinoa, black beans, and peach salsa. Sprinkle about a tablespoon of cheese over the peach salsa, and serve. You and I have super similar tastes in dinner...and in fruit because peaches are a serious favorite of mine right now! Not sure I can wait much longer to get this in my life! Peach salsa sounds so enticing!